In honor of Doodles' 10th birthday on 10/10, Genevieve insisted that we have a party for her. 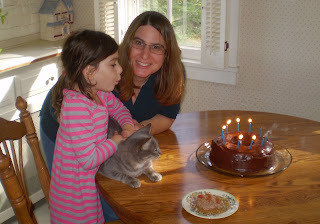 We made one "cake" for Doodles out of canned cat food, treats and catnip, and another for the human guests that was more traditional... Genevieve had to help blow out the candles. I think the cat was more confused than anything, and she got away from there as quickly as possible. Prince was also invited, although he's not in the photo. We offered him some cake crumbs, but he seemed more interested in running around sniffing at everything. Lately Genevieve has been "teaching" him tricks like a miniature gymnast. A couple of nights ago he came up with his own trick--he figured out how to escape the cage! Smart little rodent. 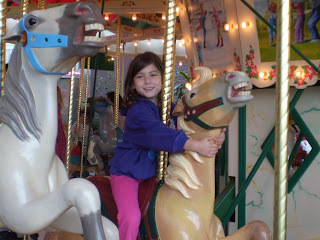 Also, as long as I'm in my Pictures Folder, here's one of Genevieve on the carousel at the Strong Museum a couple of weeks ago.